The 2018 Kia Niro Plug-In Hybrid will be arriving early next year with a starting price of $28,840, including $940 destination, for the base LX trim. 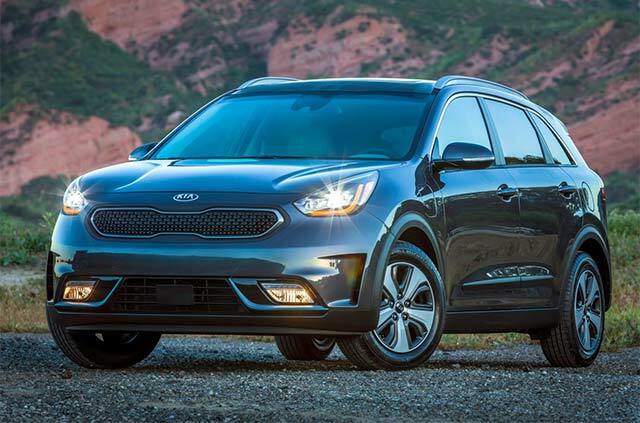 The base Kia Niro Plug-In Hybrid can be had for $259 per month for 36 months with $1,999 due at signing when factoring in the $4,543 Federal tax credit and allowance of 12,000 miles per year. The base LX trim will come standard with 16-inch alloy wheels, automatic headlights, a 4.2-inch display in the gauge cluster, a power adjustable driver’s seat and dual-zone automatic climate control. The base infotainment offering is a 7-inch touchscreen with both Android Auto and Apple CarPlay. The EX trim, with a starting price of $31,500, will add more features including heated front seats and outside mirrors, 10-way adjustable driver’s seat with lumbar support, cloth seats with leather inserts, blind spot detection, lane change assist and rear cross traffic alert. Finally, the range-topping EX Premium trim has a starting price of $34,500. EX Premium features include LED headlights, a 7-inch display in the gauge cluster, a 110-volt power inverter, leather seats with ventilation, a heated steering wheel, and an eight-speaker Harman Kardon sound system. Safety gets a boost, thanks to parking sensors front and rear. The infotainment screen gains both an inch in size and navigation capabilities. Rated at an EPA-estimated 26 miles of All-Electric Range, the 2018 Kia Niro PHEV can help some drivers consume less gasoline in most driving conditions and in all-electric mode it produces zero emissions. The Niro PHEV pairs an all-aluminum, efficient 1.6-liter GDI (gasoline direct injection) four-cylinder engine with an 8.9 kWh (59 kW) lithium-polymer battery pack and a powerful 60-HP (44.5 kW) electric motor, a set-up for optimum fuel efficiency and electrically driven range. While the Niro PHEV boasts an MPGe rating of 105, its EPA-estimated MPG ratings of 48 mpg city, 44 mpg highway and 46 mpg/combined are similar to those of Niro hybrid. The estimated driving range when both electric and gasoline systems work together is up to 560 miles.